Heat rash is an itchy skin disease that is called by other names such as miliaria rubra, prickly heat and sweat rash. It is common in places with humid and hot weather conditions. It affects infants and children more, mainly because of the underdeveloped state of their sweat glands. This medical condition is caused by several different factors including physical activity, tropical climates and immature sweat ducts. Here is a closer look at the different major and minor heat rash symptoms, as well as the different diagnostic procedures and treatments for this type of skin disease. Heat rash is a skin disease affecting different parts of the human body including the groin, armpits and back. In infants, this condition usually affects the chest, shoulders, neck and head. Primarily, there are three different types of miliaria, namely miliaria profunda, miliara rubra and miliaria crystallina. The symptoms of this disease vary depending on the type of disease. For those with miliaria profunda, early symptoms include rapid pulse, nausea and dizziness. The dermis is greatly affected, which causes irritation and discomfort to patients. Its lesions are described as flesh-colored and firm, which are very much similar to that of goose bumps. Meanwhile, miliaria rubra affects the epidermis. It can result in the development of itchy red bumps. Major symptom for this type of heat rash is anhidrosis, which is marked by the inability of the affected areas to sweat normally. The third type of heat rash is miliaria crystallina. This is the mildest among the different types of heat rash, which is characterized by blisters and bumps that are superficial, clear and tiny. There are two major risk factors, namely intense physical activity and temperate climates. 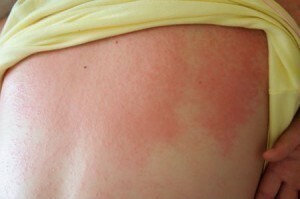 It is very simple to diagnose heat rash. Patients do not need to undergo advanced diagnostic procedures like x-rays and the like. Instead, doctors can perform a simple check of the different symptoms of the disease, as well as a brief review of the medical histories of patients. However, extra care and proper treatment must be provided as its symptoms can lead to further complications such as swelling of lymph nodes, increased pain and redness in the affected parts of the body. There are many different topical therapies available today, which are guaranteed to relieve patients from itchiness and discomfort as well as prevent the development of further complications. For serious cases, patients are advised to apply topical steroids on the affected areas. Meanwhile, anhydrous lanolin is a perfect solution for stopping the formation of lesions. It can also help in the prevention of duct blockage. To soothe itching, they can use calamine lotion.